Welcome to this second issue of your voice with news about Civic Voice and ideas and suggestions for strengthening civic societies and the civic movement. We are pleased to welcome Tottenham Civic Society as Civic Voice's 200th member. Membership continues to grow at the rate of two or three each day and the combined individual membership of all the civic societies in Civic Voice is now over 40,000. We have members from all parts of the country, from cities, towns and villages and with memberships ranging from less than 10 to several thousand. The growth of Civic Voice is testament to the ambition of civic societies. It needs to continue if we are to build the sustainable and financially independent organisation which the civic movement has called for. Now is the time to join as a Founder Member before the end of May. Office support - Volunteers are required to help with general office support including database management and assisting with telephone duties and internet enquiries. We have further opportunities for more specific roles such as fundrasing and helping with publicity. Much of this work can be done at home as well as in Civic Voice's office. Website resources - we are keen to improve the quality of information and support available on the website. Do you have ideas? What information should we be signposting on fundraising, volunteering, land use planning and heritage? How can we provide the online support which best meets the need of civic societies? How can the website build a stronger civic network? Can you help manage the site? Policy analysis - are you interested in reviewing Government and other policy reports and publications for their implications for the civic movement? For example, what does the new PPS5 on planning and the historic environment really mean? What should we think of English Heritage's National Heritage Protection Plan? Topic networks - would you like to lead an informal network of civic societies and volunteers interested in particular topics?. Networks have already begun on coastal towns and core cities and there is interest in blue plaques. What about conservation areas or canals, Heritage Open Days or out of town supermarkets? Planning reform group - a review of planning law and policy is a near certainty. Would you like to join a group offering advice and providing evidence and examples which can be used to ensure the results work for the civic movement? Photographs - are you a keen photographer with an eye for a good picture? We need you! Civic Voice is always on the look out for photographs that fit our style and we also need a volunteer to manage the Flickr site. The Board is discussing proposals for a Civic Day in 2011 and would welcome your views. The idea builds on the success of many civic societies in identifying a point in the year when they raise awareness of their work and public interest in the local area. We have received many suggestions that Civic Voice might make more of this at a national level. One of the most successful initiatives is Civic Societies Week in Yorkshire and Humber which is now in its third year and was launched for 2010 in Scarborough today. Local groups across the county are co-ordinated to put on events and activities which attract local interest and regional media coverage. They also compete for the Peter Spawforth Trophy with the prospect of a Â£250 prize for the civic society judged to have put on the best initiative. Civic societies elsewhere do similar things - from Blackpool's participation in the annual civic pride week to Midsomer Norton's celebration of midsummer's day. The idea is to co-ordinate a national day when civic societies across the country get involved and truly raise the profile of the civic movement. It might also provide an opportunity to recruit members and raise funds - with each civic society deciding what works best for them and it all hanging together around a shared day and publicity. Civic Voice would offer support and co-ordination. By joining together we will be able to make a much bigger impact and to share ideas. Tell the Board what you think and get involved in the Civic Voice Live discussion forum on 3rd June (see below). How could we make a success of a Civic Day and what would your group find most helpful? The launch of Civic Voice marks an important stage in the the history of the civic movement. We have endeavoured to set Civic Voice up in a way possible to secure its independence and a grassroots approach. We now want to hear your thoughts concerning future campaigns and projects. A discussion forum has been created on our new website which you can use to raise issues and respond to others. We also plan to hold regular "live" discussions where everyone can talk online at the same time. The first of these will be at noon on Thursday 3rd June for one hour with Tony Burton will be available to discuss the Board's proposal for a Civic Day next year. You will be sent an email (to the email address you registered with) containing a link to activate your account. Civic Voice is joining Heritage Alliance - the umbrella group for the heritage voluntary sector. As well as helping us work in partnership to influence policy and campaign this also brings a new benefit to groups who join Civic Voice. Heritage Update is Heritage Alliance's regular bulletin and has a strong reputation as a source of information and news on heritage issues. 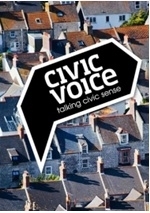 It will now be available to all members of Civic Voice through our website. Civic Voice's new Board met for the first time on 28 April, in Birmingham, with Paula Ridley in the Chair. The Board agreed the priorities for Civic Voice and started a discussion about a "Civic Dayâ€� which joins civic societies across the country in a celebration of what makes places attractive, enjoyable and distinctive and which raises the profile of the civic movement. Campaigner awards - who do you nominate? Is your civic society campaigning on an important issue in your local area? Would you like support to be a better campaigner? An SMK Award is for people who are just starting out as campaigners and want to take their work to the next level. Apply now, or if you know someone else who might benefit from an award you can nominate them in less than two minutes! Each year Retford marks the granting of its Royal Charter in 1246 with a festival. This year the Retford Civic Society took the opportunity to join the festival and surveyed over 100 people as part of the Love Local campaign. Read what the Retford Civic Society said here and get involved in the Love Local campaign here. Why not take the idea from Retford and conduct your own Love Local survey using the questions from the website. A list of the Love Local questions is also available here. You can use this to help you identify your campaign priorities for the next coming months and to help raise your profile with the local community. Dont forget to send Civic Voice the results. It is always helpful to know who your members are and what they want. A regular survey is one answer and Bristol Civic Society is on the case. The questionnaire is designed to give Bristol Civic Society a better understanding of their membership to help shape future priorities. What do you know about your members? Sometimes people say thank you! Why not join the fastest growing movement in England making the places where everyone lives more attractive, enjoyable and distinctive. Only through a growing membership can Civic Voice become independent: supported by the civic movement, for the civic movement. Join as a Founder Member before the end of May and you will receive a 10% discount.